London, has the largest and most dense city population in the United Kingdom. Its population consisted of 8.67 million inhabitants as of 2015. This number is forecast to experience exponential growth over the coming decades, as evidenced by a population forecast for London and another broken down by gender. In terms of the population of Inner London, by borough, Kensington and Chelsea had a population consisting of 157.7 thousand inhabitants. This equated to less than half of the number of residents in Newham - to the east of the city - which had the largest population of any borough, at almost 333 thousand inhabitants. 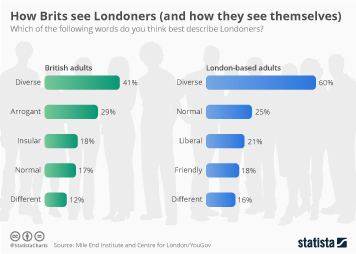 The population of inner London broken down by ethnicity reveals an almost equal distribution of people with black/African/Caribbean ethnicities and Asian ethnicities, at roughly 16 percent each. Despite yearly rises to the population of London, annual unemployment rates have experienced substantial decreases from 2011 until the most recent period, as can be viewed in statistics showing the London unemployment rate, by gender. This trend is partly reflected in the quarterly employment rates of London (by gender). An increase in the levels of employment among both genders was evident since the second quarter of 2014. In company with this growth, the (mean) actual weekly hours of full-time work in London in the United Kingdom in 2015/2016 has increased by 0.1 hours upon the previous year; this seemingly small-scale extension would have collectively contributed to the wealth generated within London. Economically London is also one of the wealthiest cities in the world, with the GVA of London equaling 378.4 million British pounds in 2015. This was largely generated by the wholesale and retail trade industry calculated at 31.3 billion British pounds according to figures on the London GVA broken down by industry. However, despite its wealth the number of rough sleepers in London has undergone more than doubled growth over the years following the 2010/2011 financial year.